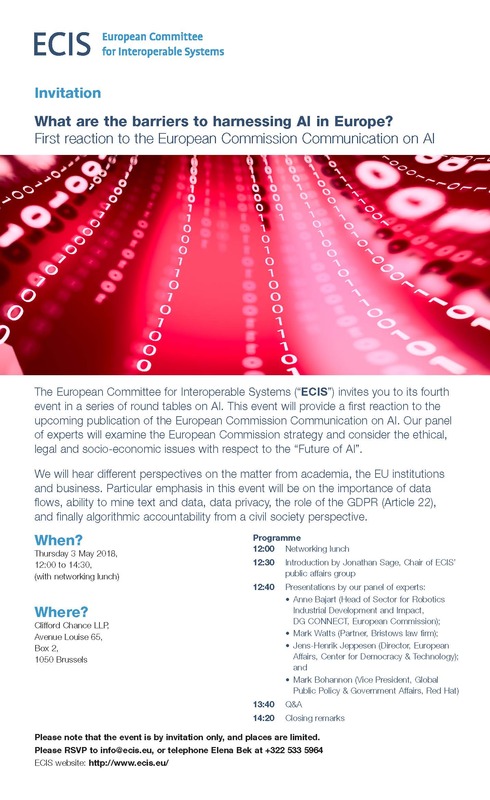 Should AI be regulated in Europe, beyond the legal framework that GDPR sets out? Is the current state of the art in AI, with the ever increasing use of big data and algorithms in our daily lives fit for purpose? 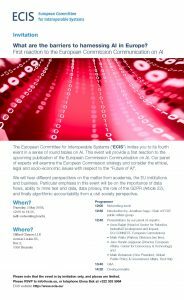 The European Committee of Interoperable Systems (“ECIS”) invites you to its traditional end of year debate on technology policy. The aim is to throw more light on the key challenges with respect to AI and big data. We will hear different perspectives on the matter from academia, the EU institutions and business. Networking cocktail Please join us afterwards for a cocktail and canapé networking reception, providing an opportunity to speak with some of our speakers about issues raised during the debate. Please note that the event is by invitation only, and places are limited. 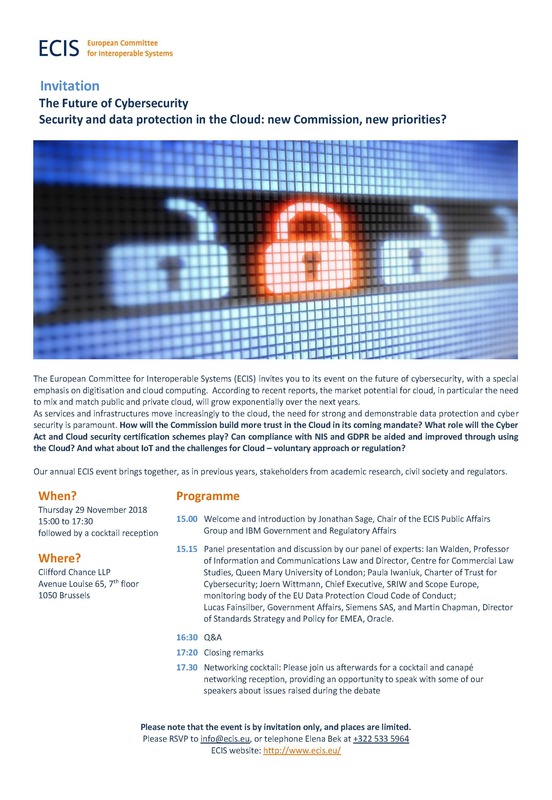 The following is a statement by ECIS commenting on the European Commission’s Communication on Resilience, Deterrence and Defense: Building strong cyber security for the EU, published on 13 September 2017. Brussels – 13 September 2017 – ECIS welcomes the Communication on Resilience, Deterrence and Defense: Building strong cyber security for the EU, in particular the European Commission’s renewed focus on education and training and other initiatives aimed at improving cyber-resilience, which ECIS has long argued should be one of the top priorities. Indeed, attacks such as Dyn and WannaCry have demonstrated that one of the greatest vulnerabilities to the Internet of Things (“IoT”) ecosystem is human error – whether clicking on phishing links, failure to update or patch systems, or lack of adherence to basic practices of cyber hygiene. Whilst it is critical that regulators across the European Union act in a co-ordinated fashion to enhance and promote a regional cyber-secure ecosystem, it is also important that they do not advance policies which could inadvertently stifle innovation and thereby undermine cyber resilience. The vast potential of the IoT for the European Union will be realised only in an EU policy climate which focuses on managing risk and empowering innovators to be sufficiently dynamic, adaptive, and responsive to an ever changing cyber threat landscape. ECIS is of the opinion that the proposed framework for certification and labelling scheme are inadequate solutions to the challenges cyber security poses. It will add complexity and costs for both providers without adequately protecting end users. In addition, ECIS fears certification could instil a false sense of security in users. International standards alignment must remain a priority. In addition, there is a need for cyber security risk management frameworks. This guidance should include information as to how respective standards address security requirements laid down in EU regulation. Where gaps in standards and certification schemes are identified these should be pursued via the normal EU standardisation system. ECIS’ member companies have a long and established track record of providing resources and operational expertise to EU authorities so as to effectively address cyber security and related policy questions. In particular, ECIS has always been an advocate of a co-operative regulation model for cyber security.